Meet Seagate 6TB BarraCuda Pro HDD: SSD-like speeds? 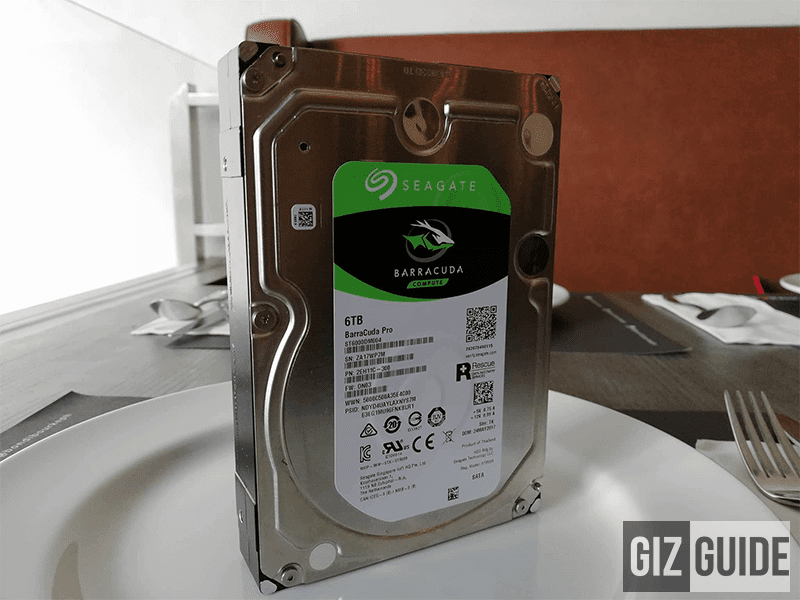 Home / features / pc / seagate / Meet Seagate 6TB BarraCuda Pro HDD: SSD-like speeds? When it comes to choosing between an HDD and an SSD, speed is the number one factor where the latter wins. However, the Seagate 6TB BarraCuda Pro HDD may break that argument now. The Seagate 6TB BarraCuda Pro is enclosed in a tough metal shell. It is pretty hefty but brings a feeling of toughness. At 780 grams, it actually feels like you are actually holding a physical representation of 6TB of data. However, you still need to be careful handling this as it is still a HDD with a lot of mechanical parts. Drops can still definitely affect it. Another thing to take note of is that the BarraCuda Pro is a desktop HDD. That means that it is not meant to be portable. It is a 3.5 inch HDD that is meant to be inside a desktop PC or an HDD enclosure. Sure, you can convert it to a portable external HDD via some HDD enclosures but this guy needs to be powered, so you need to take note of that. It also has 11,721,045,168 of guaranteed sectors with 4096 bytes per sector. This is then emulated to 512-bytes per sector. The formatted capacity for the 6TB BarraCuda Pro is 6000GB which maximize every bit of space in the HDD. Performance is great with this HDD.The Seagate 6TB BarraCuda Pro is a very fast HDD that operates via SATA interface. It has 7200 rpm rotational speed which Seagate claims to be the fastest on any HDD with that capacity. Actually, fast is an understatement! The eSagate 6TB BarraCuda Pro HDD has maximum transfer speeds for this HDD is around 220 MB per seconds. But, it can actually get to around 230+MB per seconds! That speed is right up there with the SSDs! It operates on SATA interface for faster and easier mounting. In addition to that, it has a 256MB of cache buffer which is incredible since both WD and Toshiba can only deliver 128MB of cache b on their 7200 rpm HDD. In terms of capacity, Seagate also trumps the WD since WD's Blue desktop HDD only tops out at 6 TB while Seagate's BarraCuda Pro has a 6 TB, 8 TB and 10 TB variants. We currently have the 6TB version and that 6TB alone can contain tons of files, music, games, HiFi grade audio, and etc. In terms of workload, you don't have to worry about a thing. It has an annualized average workload rating to 300 TB per year. That means that degradation will only start if you do exceed 300 TB of data transfers each year. So far, it is amazing for speedy file transfers and smooth GAMING. Seagate has really done a great job with the Seagate BarraCuda Pro. It is amazing how well they optimized this drive in terms of speed, cache and management. 6 TB of data is huge and it can get out of hand pretty quick. However, the BarraCuda Pro handles it really well. 6TB may sound really big but if you are consuming media or better yet a content creator, you know how fast a terabyte runs out. The Seagate BarraCuda Pro is a great choice in terms of HDD if you want to have SSD like speeds.